Want to make amazing corn on the cob? Slow cook it in chicken broth as part of this amazing roast chicken recipe. Dried dates, dried sultanas, dried apricots (or use 1/2 – 1 tin apricot halves). Marinade the lamb overnight in the fridge (I marinade mine in the ceramic slow-cooker pot). In the morning you can brown the meat if you want but I always skip that step for sake of convenience and dishes! Add the rest of the ingredients in order and mix as you go. The exception is the apricots, I used tinned apricots (because they’re cheaper) and they can get added 30-60 mins before you finish cooking. Turn the slow cooker on. I put mine on around 8am on Low and then checked it periodically to add a little more water (I wanted to keep the consistency to thick gravy but you can add more liquid as per preference). As always, adjust the recipe to your personal taste. You can easily add more meat or a legume of your choice (i.e. chickpeas); don’t be put off by the long spice list if you don’t have all those in the pantry, there are lots of spice blends available at the supermarket if you prefer. Allergens: Soy free (do check the chicken stock carefully though or use home made), dairy free, egg free, gluten free, nut free. I stumbled upon this recipe one day when looking for something to add to a slow-cooker stew and they were beautiful! The secret is using really cold butter (chilled or frozen) and grating it into the flour. Optional: parsley, dried herbs, grated cheese, garlic granules, onion powder, chilli powder etc. Put the flour, seasonings, & suet in a large mixing bowl, mix thoroughly. (If you are adding herbs or extra seasonings, add them now & mix well.). Add sufficient cold water – bit by bit – to make a pliable dough; it should not be too sticky, but just bound together. Divide the dumpling mixture into 8 portions, and roll into small balls with floured hands. Drop them into your soup, casserole or stew 20 minutes before the end of the cooking time, making sure that the soup, stew or casserole is very hot. Put the lid on IMMEDIATELY and do NOT take the lid off until just before the end of the cooking time, about 15-18 minutes to check that they are nearly ready. They should have doubled in size at least, and be very light & fluffy looking! Ladle the soup, stew or casserole into warmed soup bowls & serve 2 dumplings per person. 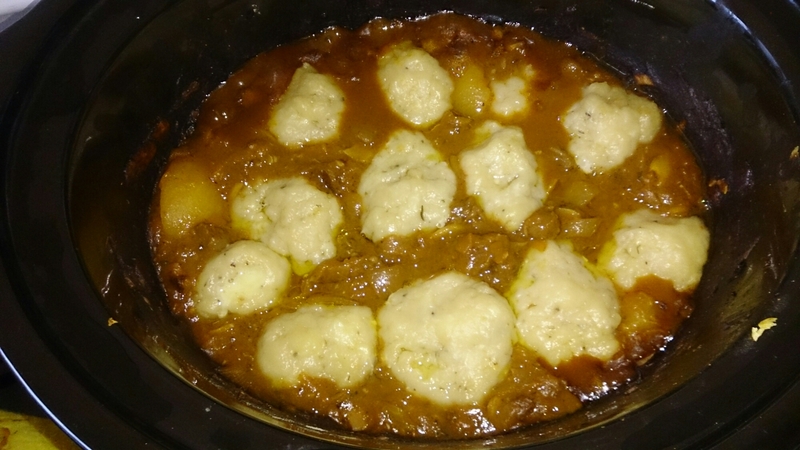 Oven baked: place the dumplings on top of your stew or casserole and cook for about 30 minutes at 200’C or 400’F, or until well risen, golden brown & crusty. Allergens: soy free, egg free, peanut free.